A new poem by Aryeh Bernstein. Criminal haven, den of thieves. We’re digging our graves with our arrogant greed. never mind the person behind the curtain. The fix is in, the deal’s sealed, hon. in the houses that you take in Sheikh Jarrah. To enhance his chances of plans to advance. or whatever, wherever home in Palestine. Border cops turn him out like he’s a party crasher. What’s happ’nin’ is a gradual de facto Transfer. You say you banned Kahanists, but you’re not being honest. I can’t take solace when you lock out the moderates. But your product, your gist, is revisionist denial. To call it “tolerant” is anti-semantic. 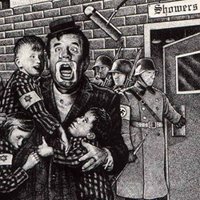 You ain’t into tolerance; you’re Auschwitz hypocrites. you’re thieves and deceive with Orwellian cover. like the Autobots on the Decepticons. you won’t wear us down, ’cause we’ll vote for Meretz******. bon voyage, by gosh, we’ll give our vote to Hadash******. * “Gilui Arayos = “revealing nakedness”, a catch-all Hebrew, legal phrase for sins of the most wanton sexual impropriety and immodesty. **MADA — Magen David Adom, “The red star of David”, ie, Israel’s Red Cross. ****”Goyim” — “nations”, a colloquial term for Gentiles, sometimes with a slightly derogatory tone. *****”tovel be-miqveh uveyadekha a sheretz” = “immerse in a ritual bath while holding an (impure) rodent in your hand.” A Talmudic phrase for the essence of an insincere, deceptive, and ultimately frivolous and pointless faux-spiritual act. ******Meretz is a left-wing political party in Israel, actively advocating Israeli withdrawal from all the occupied territories and the creation of a Palestinian state beside Israel. Hadash is a farther left, more radical party of Jews and Arabs advocating one, binational state of all its citizens, instead of partition. “heroine addicts”? addicted to Golda, Hanna Szenesh? Or is that Hannah Arendt? Builders of justice with more parks than cells. Before the east coast of communist habit of heroine came. “Anti-Zionism = Anti-Semitism” they are one and the same. If things don’t improve there will be a moat. not forge their press that paint’s a Jew as a vermin. Knowing an enemy is exceptional learning. Our blood has been desecrated not with Orwell… but Jung. With or without needles the damage git’s done. Just for the children let’s all quote cartoons. In 30 years time they will not even have clues. sorry i didnt finish A qoute from Eric Hoffer a nonJew..”so it goes with Israel ..so it goes with the world”…I beleive that with all my heart! “Israel’s suggle is a world stuggle”! sorry about the spelling! Israelis struggle is a world struggle”! Israel is attacked many times and wins wars and has to “BEG for peace” Go figure that one OUT! What a lovely poem! I remember when I was small my old man used to read this to me before going to bed. I hope that one day there may be peace in the middle east. God bless us all.